These days a reader can't pick up a magazine, read a blog post or turn on the television without hearing about buying locally grown produce, meat and dairy products. I'm 100 percent behind that and make an effort to buy Michigan farm products. My wife and I stop by road side stands in our travels around the state. But I've been doing this for a long time. I was born to it. I have my father and grandfathers to thank. They weren't trendy chefs or restaurant owners cashing in on a new trend, they were old school farm people, for which "buying locally" came naturally. It was in their back yards or down the road. So on Father's Day, I'm paying tribute to them. My father was an Arkansas kid, who grew up on small patches of farm land near Little Rock during the 1920s and through the Depression years of the 1930s. As a teenager, he raised a patch of musk melons, the best he ever saw, he said. But he couldn't sell them in Little Rock because the price wouldn't even pay for the gas needed to get them to market. He had to watch them rot in the field. It was an experience that affected him for the remainder of his life. "People were hungry in the city, and I had a good crop, but I couldn't get it to them," he'd say. In his later years he worked in an inner Detroit soup kitchen to feed people. He later attended agricultural school at the University of Arkansas, and eventually taught farming at the Henry Ford Trade Schools in Dearborn. He'd lament that urban sprawl in western Wayne County was chewing up good farm land. Because of that background, our family trips took on a new dimension. The countryside wasn't just scenery. I learned there was a reason that fields were plowed in a certain way, and that fruit trees were planted on the south and west side of hills -- to get more sunlight. Every farm building has a specific use, and the quaint wooden ones weren't built to look that way, but for a specific reason. I wish I'd listened better. To this day, when driving through the country I marvel at the architecture of old, abandoned farm buildings. I know that in my misty childhood I was once told what they were. On those trips, my father would pull over to the side of the road and walk into a farm field, pick up a handful of soil and examine it. It was embarrassing as a kid, but I now value the education. I started to value country rides with him, as I grew older. In his 70s while dying of leukemia he still had the energy to get worked up about a herd of cattle he saw. "Somebody ought to shoot that farmer for the way he's keeping them cattle." He went on to say they were covered with flies and should be washed down with a certain solution, to keep the insects away. Even when watching the TV news, he saw things differently, especially when there would be a famine in an African country. He didn't listen to the politics of it, but would look at the landscape and point out that a simple irrigation project would allow the people to have a farm plot that would produce food for people and forage for domestic animals. 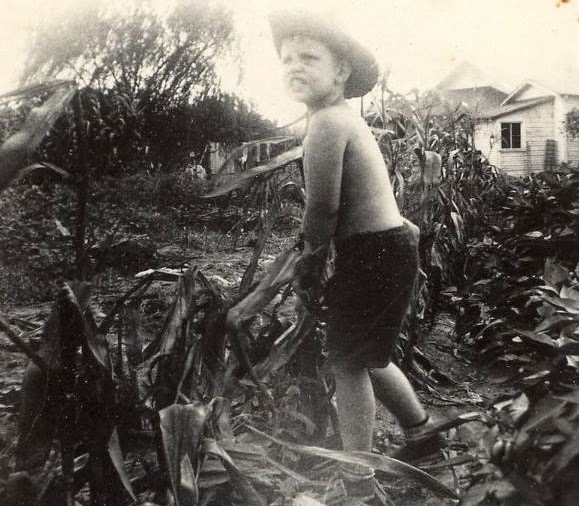 The author harvests corn in Arkansas in the 1950s. He came by this naturally. His father was a descendant of an old Arkansas pioneer family that had lived in the area since the 1840s and they were accustom to feeding themselves from a small farmstead, not an easy task during the Civil War or during Reconstruction that saw northern troops taking advantage of farmers for nearly ten years after the war. Every square inch of my grandfather's ten acre plot was dedicated to producing food. There was a large garden with okra, corn, tomatoes, watermelon, and other produce. There was a peach orchard. There were also chickens and pigs. The pigs intrigued me, they'd eat anything, and once it was almost me. I was about five and was sitting on the rail of the pig pen watching them feed. My father and grandfather were nearby picking peaches. I lost my balance and fell in the pen. I heard my grandfather yell: "Get that boy out of there before them pigs eat his guts out." It was a direct, honest lesson that affected my view of pigs for years to come. My oldest son was able to learn some of this when he went with my father and his brother to buy some sorghum near the family farm in Arkansas. He returned hours later, laughing. "It took us two hours to buy it," he said. "First, we just had to gossip with the guy, and then gently bring up the fact that we'd heard he made it. Then we had to take a taste. The guy then gave us the entire history of sorghum making. Finally, we were able to buy some." I hoped he'd learned more than just about southern politeness and how you can't be too direct when talking to an old southerner. I hope he learned that it's important to know where your food comes from and how it's made, so he can pass that along to his two daughters. The locally grown food movement may seem terminally hip, but it's really just a return to older values. I for one hope it grows.